Note: On NNR tomorrow Samantha Bunten of NBC Sports & I discussed the Browns Bills game and the impact of the QB change in the 4th quarter. The podcast is on https://fryingpansports.com/radio-show/. As I have said for weeks, the Browns are not a playoff contender. I wish they were but this team has to win the games they are supposed to in order even to be a pretender. They are not. And with this roster, they are at least a great draft away from contending. So what do the Browns do about the QB position? As anyone that reads FPS regularly knows, I am not a Johnny Manziel fan. I believe he was the wrong choice and was drafted too early. But it is clear after 12 games that Brian Hoyer is not the QB that will take the team to a championship. And make no mistake, it is the Super Bowl that is the target rather than just getting into the playoffs. If you wonder about that just ask the Bengals. I am not convinced that what Johnny did in college will translate to the NFL. Having scouted the draft since 1955, I seriously doubt it. I would have preferred Russell Wilson, Teddy Bridgewater or even Zach Mettenberger. They each were much more ready for the NFL than Johnny. But given where the Browns are now, the only choice that makes any sense is to play Johnny to see what he can do. If he plays well then the Browns have a QB that can start next year. That will be a total of 22 different starters at QB since 1999. But that is not an issue. The Browns need to give Johnny a 4 game tryout to see if he can do the job. If not then they need to draft a QB next year. While there are not many 1st round guys, there are a number of developmental QBs that will give them an option should Johnny fail in 15. A lower round QB will be a good move because they need to shore up the O and D lines. Those positions should be a high priority. Those positions are consistently costing the team wins. Without an upgrade at RG and RT, the Browns will not contend. That is also true of the D line. They thought they were deep at that spot only to see injuries ravage it. They need younger more aggressive D line players. The Bottom Line: One thing I learned early in life, there is no future in martyrdom. 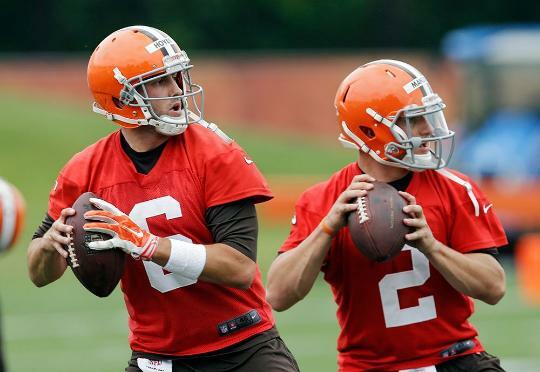 Starting Hoyer at this point in the season will only postpone the QB issue until the off season without ever giving Johnny a chance to prove he is or is not the future at the position. That would be a huge mistake. It would only cause the fan base continued despair in 2015.